Love this picture @@Treepol ! Spot the odd one out! ID wanted...These pictures were taken at the swamp area in Tarangire NP in late Sept. 2014. 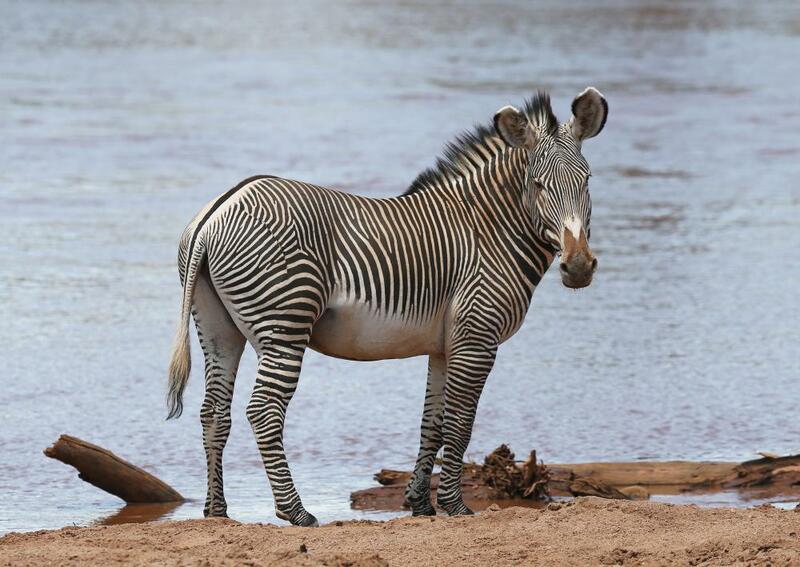 Grevy's zebra was one suggestion but it doesn't look like the pictures in the Field Guide. 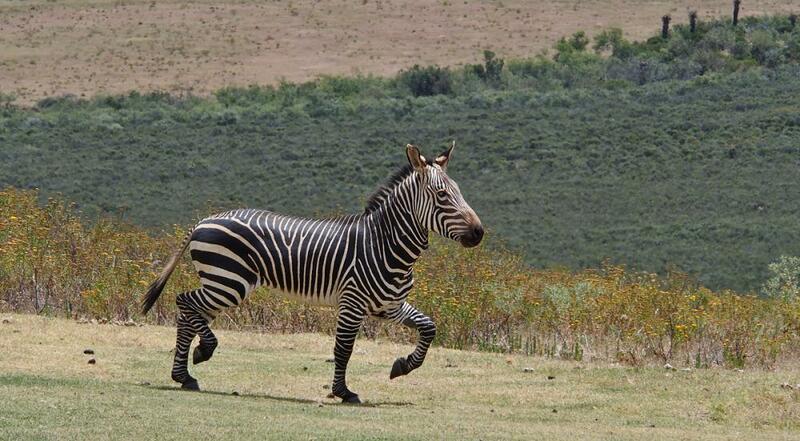 It was the only one among many Plains zebras and she looked pregnant. 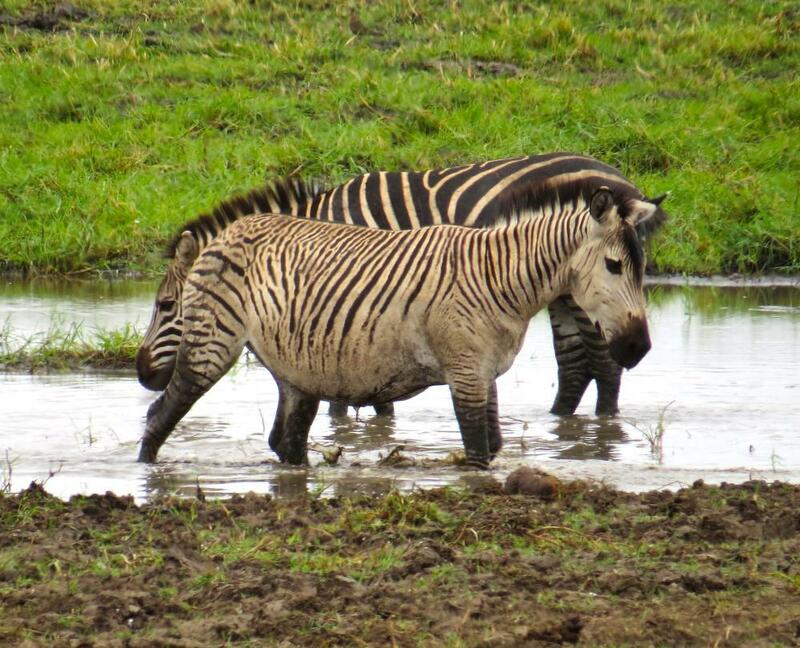 Is it just an unusual Plains zebra, a Grevy's or another type of zebra? Photographed at 5:15 pm on 28 April, 2014 in Samburu National Reserve, Kenya, using an EOS 1D X camera and an EF 400mm f/2.8L IS II super-telephoto lens. ISO 800, 1/5000 sec., f/4, 400mm focal length, handheld Manual exposure. After the exhilaration of having observed my first leopard — of several observed throughout this particular safari — there was a triumphant sense that being back in Africa was what I enjoyed more than all else. 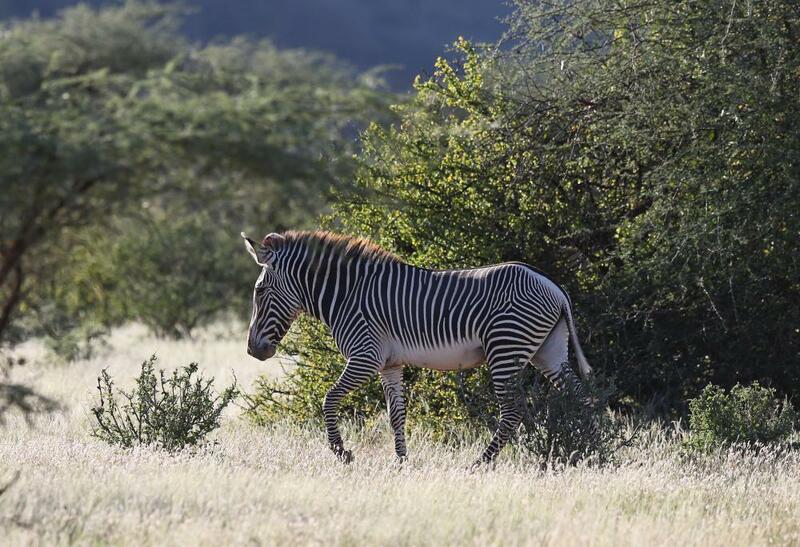 The safari van slowly rolled to stop as a small group of Equus grevyi, Grevy's Zebra, were around the track. Watching this zebra slowly walk past reminded me that for them, there are no days off and no holidays, as every moment constitutes a hard-won victory against inevitable death and oblivion. Two stallions fighting at Rietvlei Nature Reserve in South Africa. 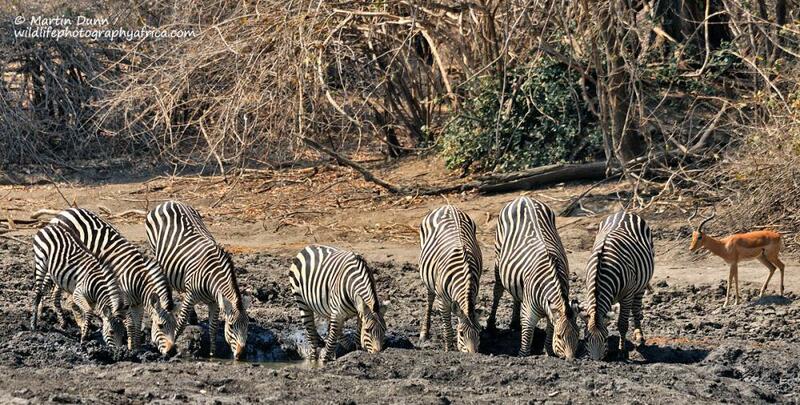 I especially like the plants shown within the same narrow focal zone as the zebras. The clear image of the eyes provides a sense of energy. Photographed at 8:09 am on 9 February, 2014 at Lake Nakuru, Kenya, using an EOS 1D X camera and an EF 400mm f/2.8L IS II super-telephoto lens. ISO 800, 1/3200 sec., f/2.8, 400mm focal length, handheld Manual exposure. 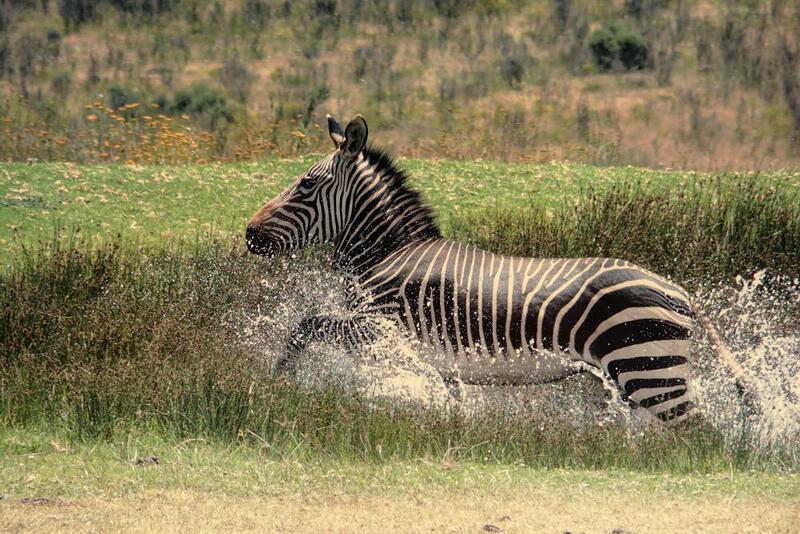 The morning game drive in Lake Nakuru National Park began with passing an open area where zebra were grazing. 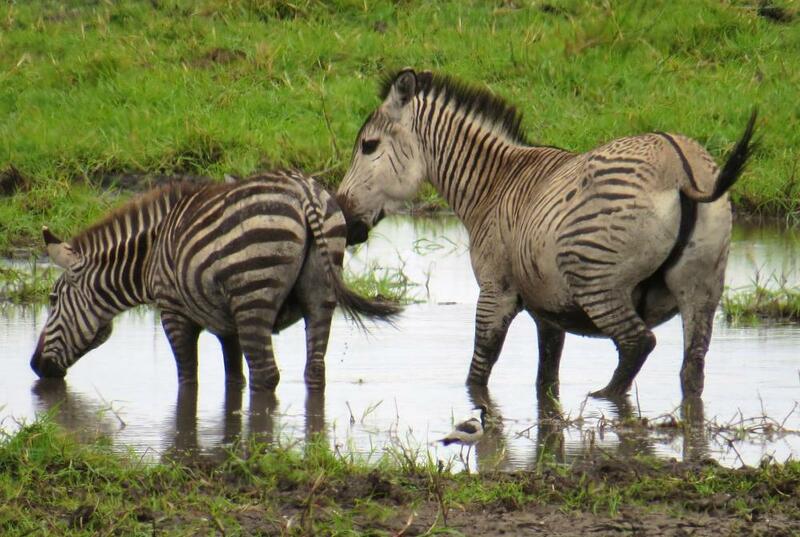 The oxpecker appeared to be telling the zebra the latest news. 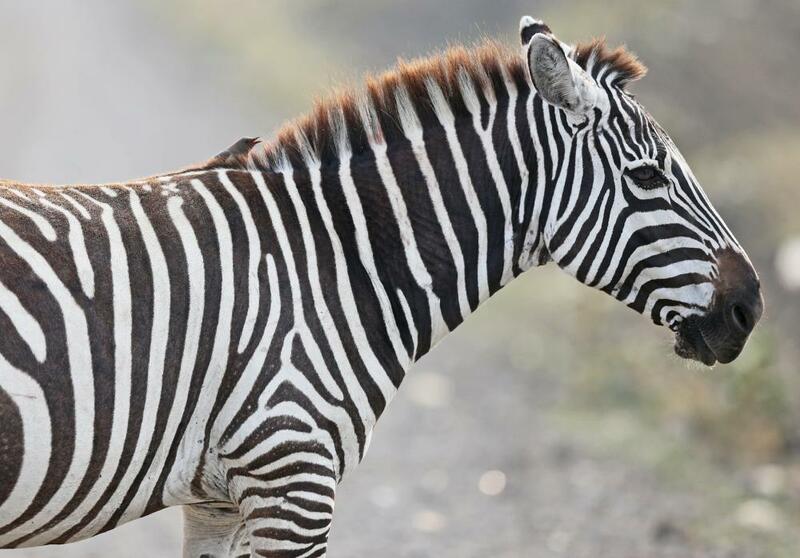 What brought a smile at the time was how the zebras ear kept turning back, as if actually listening to the small birds chatter — inter-species communication not unlike its human counterpart. ~ Photographed on 22 July, 2015 at 3:38 pm in Samburu National Reserve, Kenya, with an EOS 1D X camera and an EF 400mm f/2.8L IS II super-telephoto lens. ISO 200, f/5.6, 1/800 sec., 400mm focal length, handheld Manual exposure. 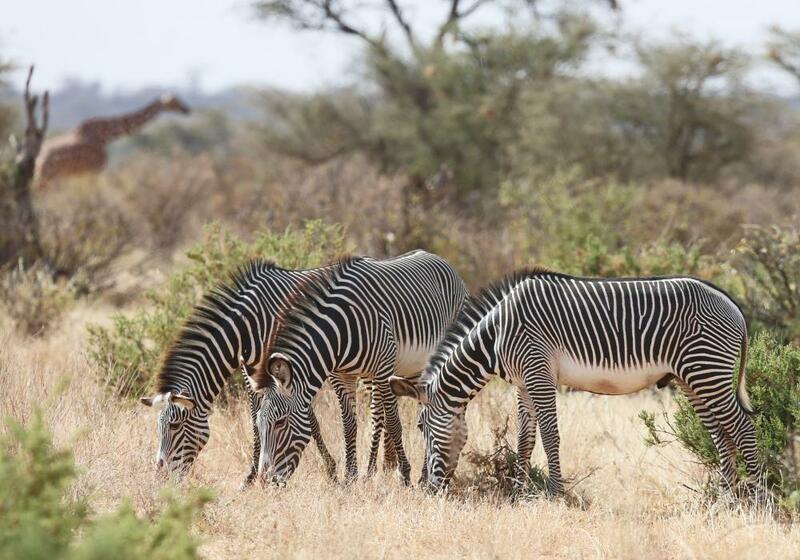 Soon after entering Samburu National Reserve, following a non-stop drive from Meru National Park, we spotted large Beisa Oryx herds, accompanied by Grevy's Zebra. A few Reticulated Giraffe were present, completing what might be regarded as a typical Samburu species mix. Seeing them felt like home on my fourth Samburu visit. 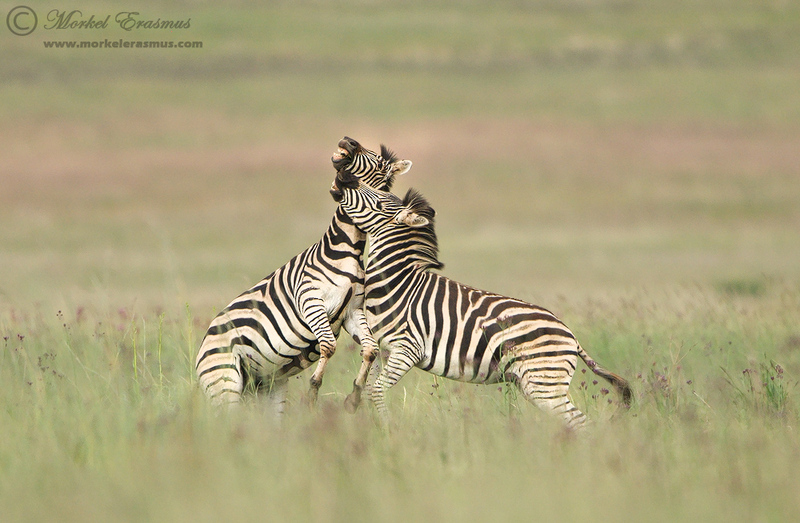 This zebra trio were grazing together, moving in slow unison. Friends? Relatives? Or no more than a momentary grouping of no particular significance? Photographed at 10:31 am on 29 April, 2014 in Samburu National Reserve, Kenya, using an EOS 1D X camera and an EF 400mm f/2.8L IS II super-telephoto lens. ISO 400, 1/2000 sec., f/5, 400mm focal length, handheld Manual exposure. 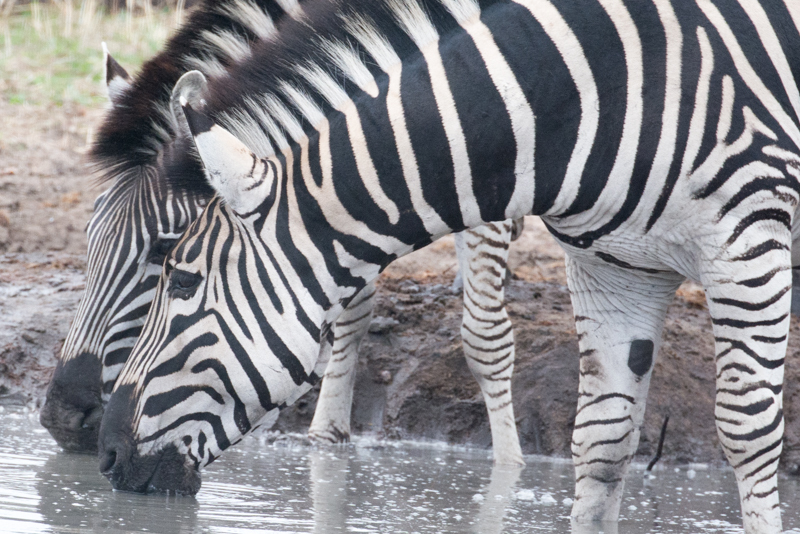 When a small family group of Grevy's Zebra walked past where we were parked, we observed them hesitantly approach the Ewaso Nyiro River to quench their thirst. Their hesitancy was wholly understandable, as a lion pride regularly rests in the shade there, watching the comings and goings of those seeking fresh water. 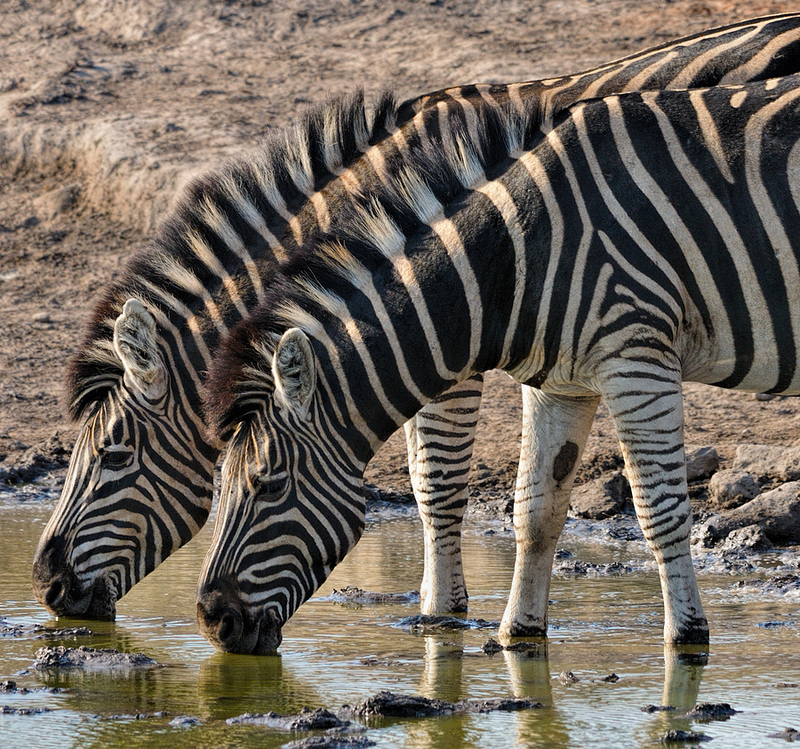 The plains zebra Equus quagga is the only zebra species in Tarangire and for that matter Tanzania the animal in your photos is just an unusual individual with an odd stripe pattern, zebras with similarly unusual stripes can occur in all plains zebra populations. 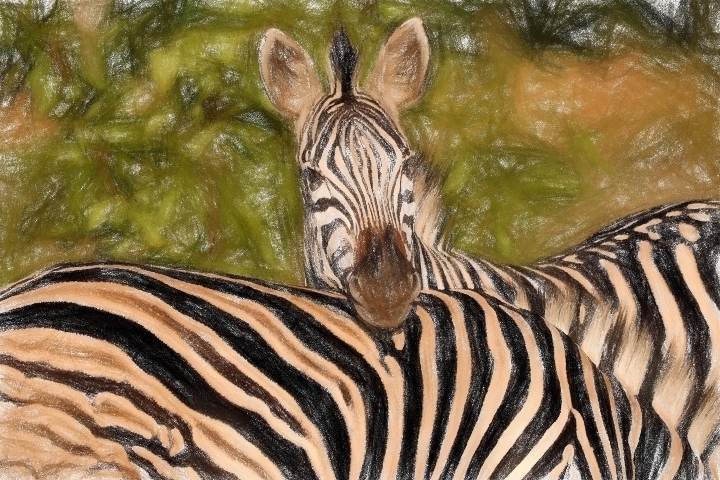 What an outstanding zebra portrait. I like the lens angle — straight-on with a sense of being scrutinized. This was probably our most emotional Etosha sighting. Near Gemsbokvlakte waterhole we spotted a dead zebra, with lots of other zebras gathering around her body, lining up to lick her face, one after another. It was clear that they are mourning her death. Is this normal behaviour for zebras? What might be the reason of her death - it seems that her belly is unnaturally bloated. Maybe she was unsuccessful while giving birth? 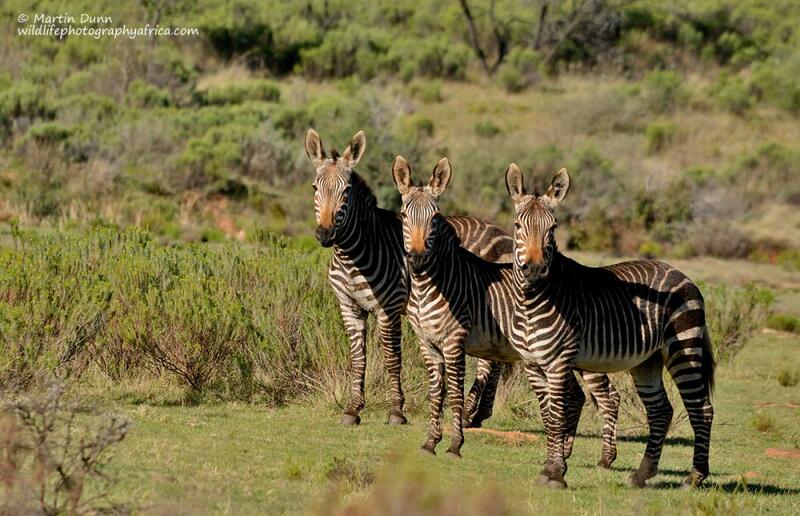 Some common Burchell's zebras from Madikwe. Can I be first to shout, "Snap"! 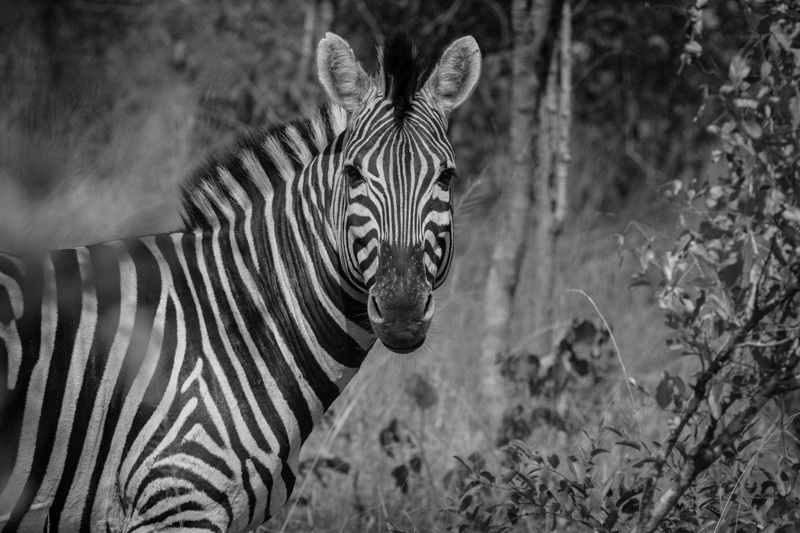 Your compelling action image above is another persuasive example of the value of black & white safari images. Recently @@Game Warden urged me to consider that with regard to African buffalo. 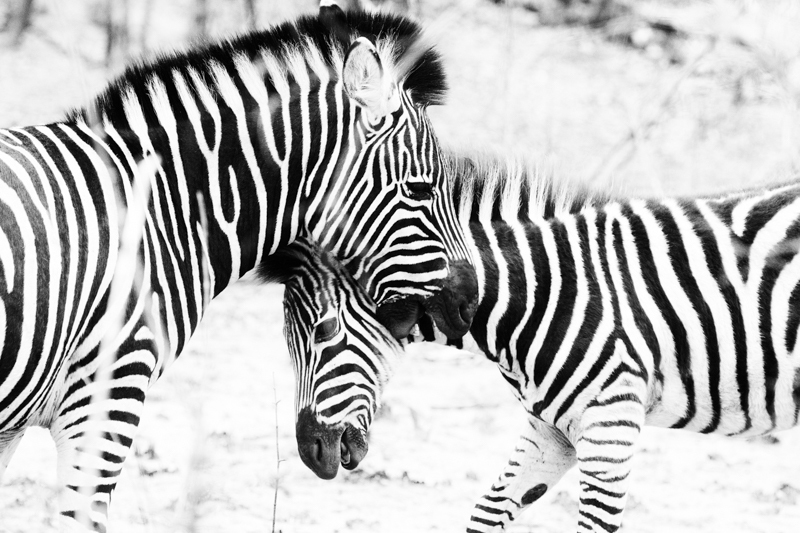 Your fine image extends that to zebra. 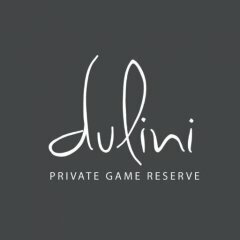 Thank you for posting it with the shooting settings. @@Game Warden - I see what you did there ?